Works for me via Xiamen website. CDG-AMS books in economy (Y), AMS-PEK books in business (O). cgtechuk, haroon145, Wildwater and 6 others like this. Based on those codes for DL, the Y legs will earn 100% base, 100% MQM, and 20% distance MQD. The O legs will earn nothing. But the the price is great if you can do without any earnings. Some flights route CDG-FOC(Fujian)-PEK on their own 787 long haul, rather than CDG-AMS-PEK on KLM metal. The stop in FOC in this case would be to change planes and clear Chinese immigration. I did try a few other desinations within China other than PEK but no dice. Looks like you can get some dates for sub-600 in the fall as well. Great find. It's possibly worth pointing out that all passengers require a visa for FOC, no transit without visa allowed at all. Great deal, I wish there was someway to work this into my schedule for the year. Great fare but not a mileage run. update: yes, KLM metals all the way, bookable on Expedia but need to hurry, as one of my preferred connections are gone, they're probably fixing it now. Looked like a very credible flash sale, with mix of y/j. choose klm over xiamen because I assume klm food is better. Useful trip to get into Asia for cx/f from Vietnam. Seems like an Error to me. 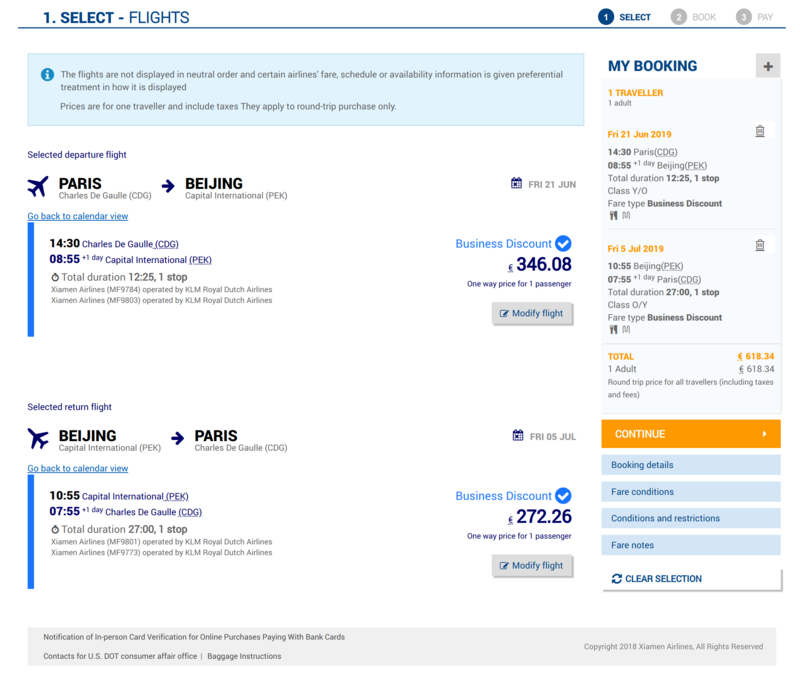 26 total hours in business for <600 seems to good to be a sale even for Xiamen which typically has cheap fares. That being said I have heard nothing but good things about Xiamen's food and service, but KLM gives you a cute little Dutch house so I think you made the right choice. Looks like 7 day minimum stay! Seems like an Error to me. You are one living Einstein. ristasm, yutuyu, Mailand and 1 others like this. Did you try to pay and see what happened? When I queried the flights they displayed $700 but when I tried to pay it either resulted in error or jumped up normal prices.